5th April came as a major milestone in the history of the Canada’s Express Entry system since its inception in January 2015. 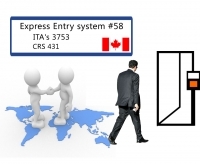 The 8th express entry draw of the year opened on 5th with the lowest CRS points 431. Candidates having a CRS score of 431 or more have received the ITA. 3,753 aspirants received Invitation to Apply in this latest draw. A total of 28,385 invitations have been issued this year through Express Entry Draw. The previous record low in CRS score was observed on 1st March where the candidates having a score of 434 or more CRS points were given ITA’s to apply for Permanent Residency. IRCC has announced to implement changes in the point based immigration system of the country. These changes will be in effect from 6th June 2017 onwards. French speaking candidates and applicants having a sibling residing in Canada on PR or Citizenship will get additional points.